Teacher Appreciation Day and Week is fast approaching. Why not get creative and make your own cards this year. Have the kids get involved and help too! Then when you are done, slide a gift card in the envelope as weel! Draw the shape of an apple on a card. I drew it in pencil first and then outlined it with the markers. Write in different words to describe a teacher. If you want to personalize it, include the name of your child's teacher! So get creative and make sure the teachers in your life know what they mean to you and your kids! First of all you will need to open the lip balm and use the lid to draw a circle you plan on cutting out. Then the fun comes with deciding on what you want your circles to become! I opted for a flowers and hot air balloons. Use the makers to create your design. If needed you can always use a pencil to draw on your designs first. 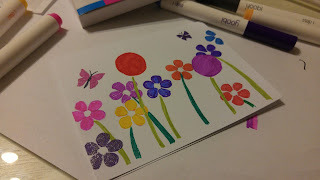 Then use the Gel Pens and Glitter Gel Pens for smaller areas and to create accents. After you are done cut out the circle and twist in the lip balm.